‘How negative parenting emotionally scars us’ self reflection. I used to be a control-freak. I am sure I got it from my mom, she would keep us all in line and demand that everything be done her way. And her way was not always the best, but any changes to her system were not welcome, and we were always scolded, yelled at, and punished. I grew up in a house of million rules and zero flexibility even when we were little kids. We were taught to fear and expect the worst when we allowed ourselves any independence in making even minor decisions regarding pretty much anything you can imagine, and she was never ever happy with anything we did, because we never did it right. This was part of my mom’s idea of strict discipline, and she never saw how this would contribute to a broken relationship we have with her today. There is too much misunderstanding, mistrust, disappointment, and anger we both feel for each other. Sad. So, when I grew up I subconsciously expected everything to be done my way as well. It almost physically hurt me when something didn’t happen the way I expected it, and I would get stressed when people didn’t do things how I thought they should do them. It especially became obvious when I got married. I was never happy with how my husband did some things around the house, for example. Or how my stepdaughter would do or not do certain things. Needless to say it put unnecessary stress on me and on the whole family. They even made fun of me saying I have a rule for everything in life. Scary, isn’t it? This must have been one of the hardest negative parenting results to get rid of, but it was one of the most liberating ones as well. Slowly I started analyzing myself and trying to see why I behaved this way, and how I could be a happier person. My husband helped me realize it must have been childhood-related, and then I started trying to take things easier and just let go of insignificant, non-important issues. Life became more enjoyable and simple. Now, with two little kids of my own, I am proud to announce that I don’t need to be in control of every situation, and of every family member. They are individuals, they do things their way, they have their own opinions they are entitled to, they should NOT do things my way and expect the worst when they listen to their hearts instead of my crazy control-freakish self. Was it easy or, even, is it easy all the time? No, I still slip once in a while, and have to make an effort to relax more and get over my childhood issues. This is just one of the many examples a lot of us can relate to, and, I am sure, you can share many more. 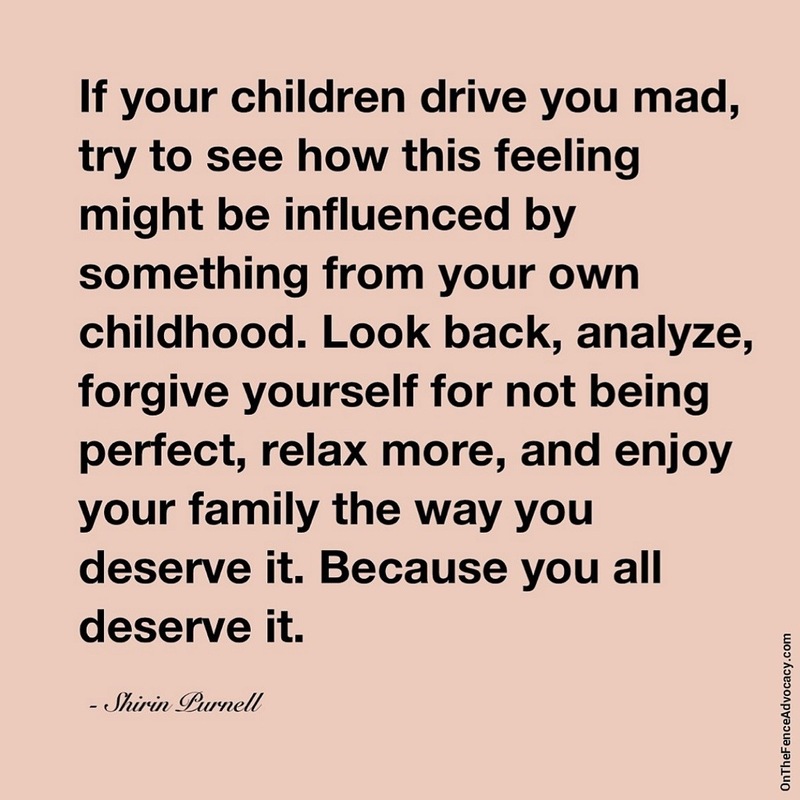 I only wish we always tried to analyze why we get disappointed with our children’s behavior, why they get us mad at times, and how our own childhood makes us these parents we are not too proud of. It is not our kids’ fault, it is, most likely, our own issues we need to work on before we can be the best parents we can be to our children. Difficult? Probably. Doable? Absolutely. Worth trying? OH, YES!!! Thank you for trying and good luck.